In brief, very brief, he's gone from the Academy of Fine Arts in Vienna to photographing the Rolling Stones and Andy Warhol to making subjects out of Klansmen, Disney characters, and Malcolm X. He's had exhibitions protested, banned, vandalized, and honored, and his portrait of Kennedy was on the cover of "Time" magazine. He's exhibited everywhere from galleries on Finland, Japan, Russia, and London to museums like MoMA and the Smithsonian. He uses everything from oils, acrylics, computers, inks, crayons, costumes, and set design; and his work has inspired articles, films, television shows, and books. Even down to the only thing you late on the fashion bandwagon, rock T-shirt-clad readers might be familiar with, the bandaged-faced, forked-eyed self-portrait on that Scorpions album "Blackout" (which, regardless of our opinion on the quality of the music, is still a sick picture), Helnwein has managed to master the surreal. So why is it you may never have heard of such a brilliant purveyor of radical work? Well. my guess would be that you're as American as I am, and, like most Americans, don't really know anything about fine art and couldn't on your best day name five living artists who aren't involved in graffiti, fashion photography, or painting things with feces. A concept which doesn't seem to bother Helnwein, who joins his unique position of slight anonymity and total freedom in a world of constant celebrity. In fact, since establishing a studio in Los Angeles a year ago, Helnwein has made it a priority to use the freedom that the city - which he loves and isn't afraid to defend to its fullest - provides to continue pushing his work. Shifting from the generally macabre to the stunningly majestic, Helnwein has begun painting a series of landscapes. That is to say, gigantic, masterfully detailed American landscapes that look so much like photographs it's unnerving. He's also taking on various visual mediums with some names you're more likely to know like Sean Penn, Jason Lee, and Marilyn Manson. 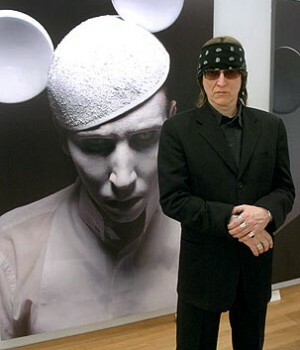 Helnwein, who currently divides his time between his downtown Los Angeles studio/gallery and his home in Ireland, is having no trouble coming up with new ideas, hosting shows, or gathering new admirers, which is something else he seems to enjoy about Los Angeles - the reactions. For him it's all a matter of doing what he loves and having people see it. If in the end they decide to hug him or run away in disgust is, I suppose, a question of interpretation.